"My Name is Philippe. I come from a town called Epuisay in the Loir-et-Cher region of France. I arrived in England in January looking for a new experience with just my bag and my money. I started by going to Manchester as it’s a big city, and cheaper than London. Two weeks after arriving my cash was stolen from the youth hostel I was staying in. Despite this setback I stayed motivated to start a new life. I went to the Booth Centre for help where I met the awesome staff; beautiful people who gave me good advice about what I could do to make a decent life. They helped me find training, and they were contacted by Scafell Hotel in the Lake District who wanted to help people in my situation by offering paid work and accommodation. I started work in March as a kitchen porter at the hotel. It is a beautiful place in the middle of mountains. The staff are very friendly and welcoming, like a little family. Now I am a chef with my own room in the staff cottage and all my meals provided. I don’t need anymore than this - it’s the dream life! I would like to thank all the people who pushed me, and helped me through these hard times. I will never forget this new start in my life. Thank you to Booth Centre, the night shelters and the Scafell Hotel's staff for helping me." "A recent documentary about homelessness really moved me to want to do something to help people trapped in this endless cycle. I was recruiting for a kitchen porter at this time and decided to give a homeless person a chance. So having contacted the Booth Centre, Philippe joined us and went from sleeping rough to his own room, three cooked meals a day and a good monthly wage with no bills to pay. 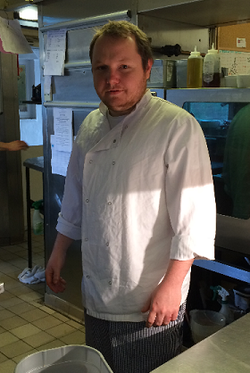 Philippe has been an asset to the Scafell Hotel and has now been promoted to a Commis Chef! My husband and I believe hotels are a perfect answer to helping the homeless as lots provide the accommodation needed which appears to be one of the main missing links. They now have an address and can now get a bank account. If every hotel in Manchester took on one homeless person then the problem would be at least halved." If any other businesses would be interested in working with us to help get people with experience of homelessness into work, then please get in touch. We have people with skills, experience and enthusiasm who just need someone to give them an opportunity and support.